Organised in a different European city each year, Afera’s Annual Conference is the premier European adhesive tape industry event. Open to members and, on a limited basis, non-members, Afera’s Conference is attended by more than 100 company delegates representing businesses along the adhesive tape industry value chain: manufacturers; raw materials, machine, and packaging suppliers; converters; research institutions; national tape organisations; and other international counterparts. 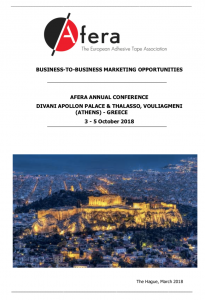 For the Afera Annual Conference 2018, Afera members are once again offered Business to-Business Marketing Opportunities. This is a unique platform to reach your customers directly. All sponsors will be published in the conference details handed out to participants upon arrival, and will be listed in all future communications in relation to the conference. All sponsors will be published in the Annual Conference materials distributed to participants upon arrival and will be listed in all future communications related to the event. Interested in sponsor opportunities? You can find the Afera Annual Conference Sponsor Opportunity Documentation here and the application form here.